What are the simple, quick and astonishing secrets that have enabled more than 30 million people to achieve their dreams - and that YOU can use to start living the life you've always known was possible? An old volume revealed the secrets to success in any and all undertakings we attempt in life! Achieving what you want is easy ... when you stop pushing and activate your automatic success mechanism! The human mind functions much like a goal-seeking device similar to those used to guide missiles on auto-pilot! What it IS, is me simply using the most powerful, yet easiest, secrets to an instant life-changing turnaround! In just a minute, I'll describe the UPDATED version of Dr. Maltz's system that my partner — and marketing genius — Dan Kennedy has created for you with the great folks at Nightingale-Conant. A little while ago, Dan went into the Nightingale-Conant studios in Chicago, and for the first time in more than 40 years, created an updated, 21st-century Psycho-Cybernetics program, The New Psycho-Cybernetics, that is now available to you ... IF you act quickly! Now, Dan's updated program is not only more complete, full of more of Dr. Maltz's secrets and techniques than the original Dr. Maltz materials contain ... but it makes it way easier and faster to learn and benefit from! The way Dan put this program together combines the wisdom of Dr. Maltz with the updated technology available in our modern era! You'll also receive a set of six Psycho-Cybernetics key-point, PDF reminder cards and six Psycho-Cybernetics PDF, cue-word cards, which you can use to ensure immediate, practical results. You can carry these cards with you and post them in prominent places, to trigger your use of the techniques in the program. 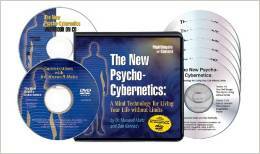 Please send me Dr. Maxwell Maltz & Dan Kennedy’s audio program The New Psycho-Cybernetics — including the 6 CDs plus DVD, Workbook on CD, PDF Reminder Cards, and PDF Cue Cards - for just $69.95 - which is $200 OFF the regular program price. Take advantage of this limited-time special discount now! GUARANTEE: If I do not discover how to re-engineer my self-image in the next 30 days, I will return the program for a full refund. No questions asked.